Croatia is a highly popular country in which to spend time. Warm temperatures, clear blue waters, and friendly residents make this location ideal for vacations throughout the year. 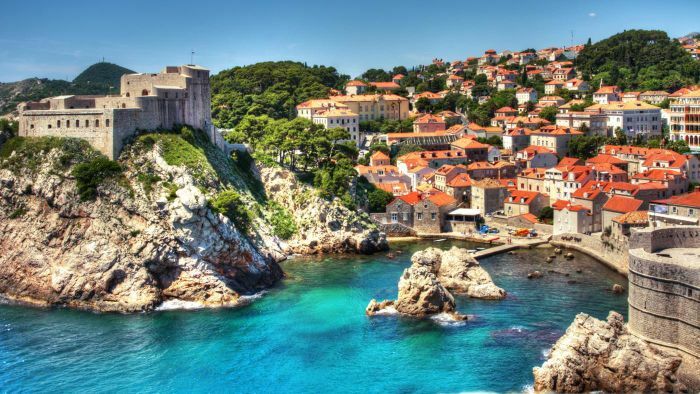 Croatia boasts many interesting landmarks and attractions, and its picturesque scenery and historically important cities and archaeological sites make it well worth a visit. With its dramatic cliff top location and imposing sea walls, Dubrovnik is often referred to as the “Pearl of the Adriatic.” One of Croatia’s most visited destinations, it features spectacular landmarks, such as the majestic Lovrijenac Fortress, and offers a wealth of photo opportunities. To enjoy the best views, take a scenic stroll along the City Walls or hop on a cable car to the impressive peak of Mount Srd. Zagreb is Croatia’s capital city and is situated in the Northern half of the country. Ban Jelačić is the central square and serves as a meeting point for both tourists and local residents. Here, you can observe typical Croatian life, visit the Ban Josip Jelačić Monument, or spend a morning or afternoon shopping in the Zagreb Market. Additionally, Lake Jarun in Zagreb hosts the INmusic Festival each year, the latter of which is a three-day music event with a consistently great lineup of performers. If you are looking for a charming, laid-back area in which to relax and rejuvenate, you should consider a visit to the quaint and picturesque fishing village of Rovinj. This village draws a steady stream of travelers each year, as it is worlds away from the more boisterous resorts of the South. You can sunbathe in secluded spots along the coast or hike through the Golden Cape Woodlands. Whichever option you choose, you will thoroughly enjoy spending time in Rovinj. Another top destination on the Dalmatian Coast is the city of Split. As Croatia’s second-largest city, Split is a beginning point for day trips and island hopping cruises, as well as a major port. The city’s top attraction is the spectacular Diocletian’s Palace. However, the area also offers many outdoor activities, such as sailing tours, rock climbing excursions, and white water rafting. Situated halfway between Split and Dubrovnik, the town of Makarska is a popular stop for those cruising around Croatia. Set against the backdrop of the craggy peaks of Mount Biokovo, Makarska’s colorful harbor and lively beaches offer the perfect atmosphere for a family-friendly vacation. You may also wish to hop a ferry to the nearby Brač Island for a day of exploring. National Park Plitvice Lakes is Croatia’s largest and oldest national park. It was named a UNESCO heritage site in 1979. As suggested by its name, the park is famous for its lakes. It is also renowned for its broad range of wildlife and plants. If you have an adventurous spirit, you will not want to miss a trip to this enchanting Park. The world’s smallest city, Hum, is located in Croatia and is definitely worth a visit. Although it has everything a big city needs, it is home to only 24 inhabitants. It features a church, wine house, and an impressive city wall, and its beauty and historical significance have fascinated tourists for decades. The Pula Arena is an outstanding amphitheater located in the city for which it was named. Offering seats for 23,000 visitors, it is the world’s 6th largest amphitheater. Built between 2 B.C. and 14 A.D., the Pula Arena is still used for events in theater, music, and film because of its brilliant acoustics. The Klis Fortress is one of Croatia’s best-kept secrets. It provides a glorious view of the town of Split, the surrounding countryside, and the sea, yet it is not usually crowded with tourists. Originally built to monitor a major inroad to the city, it is now a beloved landmark among visitors and locals alike. It was very important to the ancient civilization responsible for its construction and was conquered many times. However, it has somehow remained relatively unchanged through the centuries and is an impressive sight to behold. The Velebit is a Croatian mountain range that is perfect for trekking enthusiasts. It is located at the coastline and is the largest mountain range in Croatia. Mysterious caves, a terrific view of the sea, and lovely mountain peaks all make The Velebit a unique place in which to spend time. When in Croatia, you can schedule visits to multiple destinations or just a few. Either way, this celebrated country has everything you could desire. Regardless of whether you are planning a honeymoon, quick getaway or an extended vacation, a trip to this beautiful and intriguing part of the world will never be forgotten.